From JPG, PDF, PNG, EPS, AI, BMP, GIF, PSD, INDD to SVG, no one can blame you for not keeping up with all the different logo file types that exist. And yes, all of the above are file types for logos, AI isn’t referring to Artificial Intelligence and PNG isn’t just a country it’s also a Portable Network Graphic. Each file type serves a specific purpose so we’re going to take you through the key players and explain their roles and uses. This is Circle Media’s logo file types cheat sheet, but don’t worry there won’t be a test. 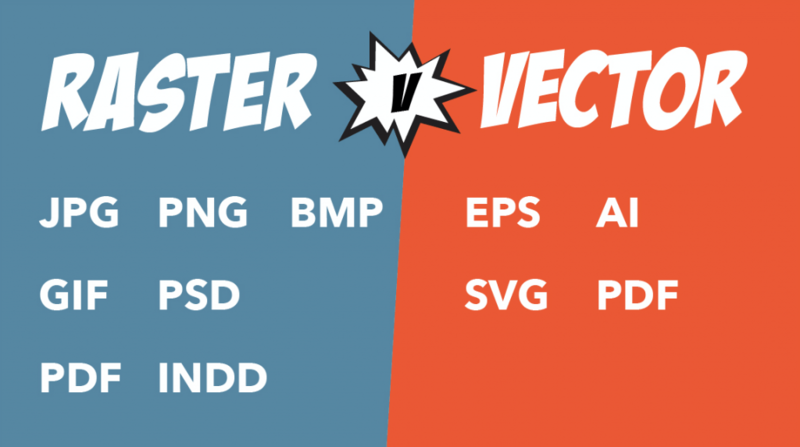 Before we jump into file types, it’s important to note that all graphic based files can be divided up into two distinctive categories: vectors and rasters. Vectors are made up of smooth curves and lines and are used primarily for logos and design work. They retain image quality well throughout resizing and reproduction, but aren’t widely compatible with software. Rasters on the other hand, are made up of millions of pixels, and are typically used for websites and digital publications. Digital photography takes the form of a raster, and they’re widely compatible. But, they typically have a large file size, resize poorly and quickly become pixelated. Understanding the difference between these two types of images is helpful when knowing where each file type gets used. AI files are a designer’s best friend and likely where they originally created your logo. However, they’re not readily accessible, as you need Adobe Illustrator to open them. EPS files are the industry standard file type as they can be imported into all major design programs. It’s the designer’s PDF and if you’re getting a logo designed you should always be provided with an EPS file to ensure you or your designer can edit the logo. Note that only certain programs can read EPS files. You may receive an EPS file from your designer that looks empty, but never fear it will work for those in the relevant industry when they need it. The PDF is the universal file format. It’s not really its own file type, but rather a wrapper for different file types. A JPG is simply a compressed image file and one of the most commonly used formats for everyday use. It doesn’t support a transparent background and when repeatedly compressed it can lose quality and doesn’t scale very well, becoming pixelated as it is enlarged. PNG files are good for low resolution needs such as online and website work. We will also make sure you have a version of your logo that is on a transparent background and in both RGB and CMYK colour to ensure you are able to meet all your requirements. If you have any questions about logo design, about removing a white background or converting a file, talk to the team at Circle Media today. And hopefully now you’ve looked at our guide you’ll know why an .EPS won’t open on your machine.